Robotic technologies developed in the auto sector are now driving innovation in horticulture. This is our March/April 2013 cover story. A popular recycling program for farmers is being expanded to include new products. 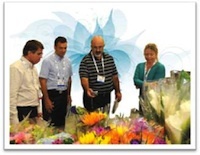 International Floriculture Expo June 18-21, 2013, Miami Beach, Fla. Attend the only industry trade event that brings together all aspects of the industry to FOCUS on FLORAL. If you're a buyer, merchandiser, florist, garden center or grower ... IFE is where you’ll find the connections, education, ideas and products you need to grow your floral business in today’s competitive market. Register today and use the code GREENCANADA when registering. Controlled Environments Ltd. (Conviron) has acquired Argus Control Systems Ltd. (Argus) of White Rock, British Columbia. Sales of greenhouse, nursery and sod products in Canada topped some $3.3 billion last year, according to StatsCanada.